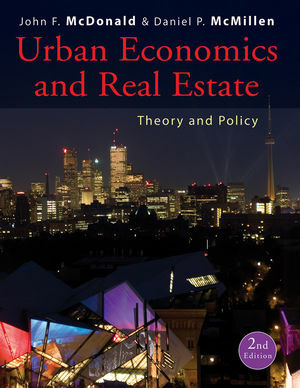 Unique in its coverage, Urban Economics and Real Estate allows an instructor to teach separate courses in either urban economics or urban real estate, or a blend of the two topics. The portion on urban economics focuses on urban/suburban growth—physical as well as job growth. The interplay of federal government and local authorities is discussed, and the effects of social problems, such as crime, poverty, and education that often accompany these changes are discussed. While the latest data sets available are utilized, Urban Economics’ emphasis is on economic analysis. The real estate chapters emphasize housing markets, appraisal, business investments, and their relationship to finance. New to this edition is extensive coverage of international issues in cities around the planet. Given the rapidly changing empirical side of urban demography, the text is accompanied by a website with new examples added annually and various discussions/tips about the latest data sets that become available. John F. McDonald is currently at Roosevelt University, Chicago, as the Gerald W. Fogelson Distinguished Chair in R.E. John McDonald was Emeritus Professor of Economics and Finance at the University of Illinois at Chicago. He holds a Ph.D. in Economics from Yale University. At UIC he has served as Professor of Economics and Finance, Founding Director of the Center for Urban Real Estate, Senior Associate Dean for Academic Affairs and Research, and Interim Dean of the College of Business Administration. Other positions held include Research Director at NCI Research, and Adjunct Professor of Economics in the Graduate School of Business, University of Chicago. Well known for his research in urban economics and real estate, he is listed in Who's Who in Economics and is author of seven books. He currently serves as editor of the Journal of Real Estate Literature. Daniel P. McMillen is a professor of economics at the University of Illinois at Urbana-Champaign. He has held an appointment at IGPA since 2002. His research interests are urban economics, real estate, and applied econometrics. He is editor of the journal Regional and Urban Economics, and has served on the editorial boards of five other journals. In 1998 and 1999 he served as the chair of the Department of Economics at Tulane University. In 1998, he was a research fellow for the Center for Urban Real Estate and Land Economics at the University of British Columbia. He received his Ph.D. from Northwestern University in 1987. Part I: Economics and Urban Areas. Chapter 1. Introduction to Urban Economics. Chapter 2. Schools of Thought in Urban Economics. Chapter 3. Location Decisions, Agglomeration Economies, and the Origins of Cities. Chapter 4. The Economic Functions of Cities. Part II: Location Patterns in Urban Areas. Chapter 5. Introduction to Urban Location Patterns: Static Analysis. Chapter 6. Using the Monocentric City Model. Chapter 7. Empirical Testing of the Moncentric City Model. Part III: Urban Housing and Real Estate. Chapter 8. Housing in Urban Areas. Chapter 9. Housing Policy in the United States. Chapter 10. Real Estate Law and Institutions. Chapter 11. Real Estate Markets. Chapter 12. Real Estate Development and Investment. Part IV: Government in Urban Areas. Chapter 13. The Public Sector in Urban Areas. Part V: Urban Social Problems. Chapter 15. An Overview of Urban Social Problems. Chapter 16. Urban Poverty and Its Spatial Concentration. Chapter 17. Crime in Urban Areas. Chapter 18. Education, Labor Markets, and Migration. Chapter 19. Models of Metropolitan Economic Growth. Chapter 20. Agglomeration Economies, Technical Change, and Urban Growth. Chapter 21. Economic Development Policies for Urban Areas. New chapter on Urban Poverty in Developing Nations to go along with the Poverty in the U.S. Cities chapter. Extensive international examples from Europe and Asia interspersed throughout the text.